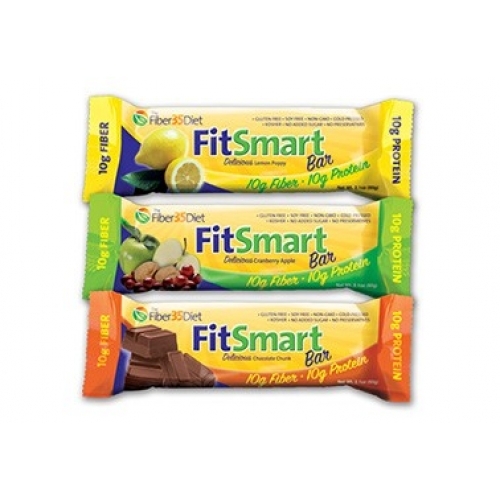 Each Fiber35 Diet FitSmart Bar is a convenient, all-natural and nutritionally balanced snack bar containing 10 grams of fiber and 10 grams of protein. Beneficial whey protein and natural acacia fiber work together to keep you feeling satisfied between meals. Each FitSmart Bar is made with nutrient-rich fruits, nuts, seeds, whey protein and acacia fiber , contains no added sugars or trans fats. It comes in 3 delicious flavors: Chocolate Chunk, Cranberry Apple and Lemon Poppy.